Sidewords turns the traditional conventions of word games on their heads in a way that is truly unique and fun. It's remarkably hard to get excited about word games these days. Most of them are just recycled versions of ideas (or even whole games) you've seen before. Even the exquisite Typeshift was a new take on crosswords to a certain extent. This is not something that can really be said of Sidewords though. Sidewords is one of the most bizarre and original word games I've come across, and it's extremely fun to boot. Sidewords's formula for word game success doesn't come from testing your speed or your vocabulary, but rather your creativity. Across both of its game modes, there are no timers, and you don't get extra rewards for using more letters. 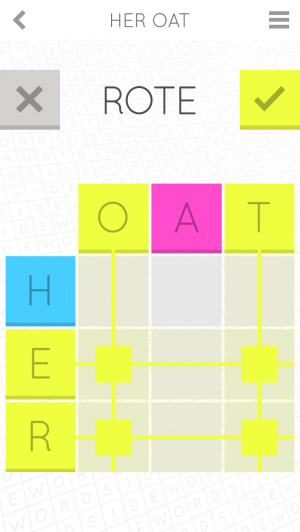 Instead, the game forces you to find novel ways to arrange letters given a certain spatial arrangement. 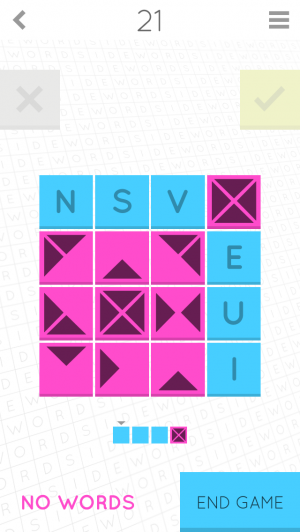 To explain, Sidewords's primary mode, Puzzle Mode, presents players with a grid. On top and to the left of each grid is a word, and your goal is to use letters from both of these words to form new words in the grid. The catch here is that spaces in the grid only get filled in if they are an intersecting point between two letters you've used. It's a bit of a confusing concept to try and explain, but Sidewords is designed so that its spatial mechanic is super easy to grasp as soon as you start playing. 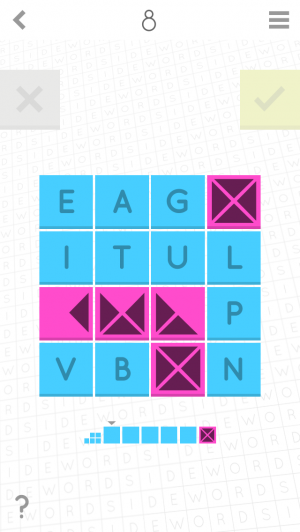 The Puzzle Mode in Sidewords offers a great set of grid puzzles to play around with, each with their own unique sets of words and custom grid sizes, but it is not an endless mode. If you find yourself in a situation where you've finished all of those puzzles or are otherwise in search of something else from Sidewords, look no further than the Quads Mode. Listed as a sort of “bonus game” to the puzzles in Sidewords, Quads Mode might very well be the main draw to the game for some people. In this mode, you are presented with a 4x4 grid with three letters on it. From here, you can swipe in any direction to have additional letters enter the grid. Every once in a while, a purple box will appear on your grid, and you have to build words using the existing letters on your grid around the purple boxes to make them disappear and score points. Again, this might sound kind of complicated, but it very much feels like a word version of Threes!, which–I must say–is pretty awesome. A big part of what makes Sidewords such a great experience is its design. It's minimal look contains just the right details to always fully communicate to you how its game modes work and what you can and can't do given the game parameters. In addition to this, the fact that Sidewords isn't particularly concerned with speed and accuracy really lets you play around and have fun with its mechanics without making you feel frustrated. In the Puzzle Mode, you can always back out of words that you've made, and Quads offers up hints if you find yourself puzzled into a corner. Sidewords is an unexpectedly fantastic word game.Itoffers up a great mix of designed and procedural puzzles that are fresh and interesting, which is not something you can say too often about word games. If you're looking for a truly new word game experience, this is the game to get.